LOCATION.--Lat 39`49'30", long 79`55'23", Greene County, Hydrologic Unit 05020005, on left bank, 84 ft upstream from Lock and Dam at Grays Landing, 0.9 mi upstream from Masontown, 1.2 mi upstream from Whitely Creek, 5.3 mi downstream from Dunkard Creek, 7.6 mi downstream from Cheat River, at mile 81.9. GAGE.--Water-stage recorder, heated tipping bucket precipitation gage and concrete dam control. Datum of gage is 769.00 ft above National Geodatic Vertical Datum of 1929 (U.S. Army Corps of Engineers bench mark). Prior to Nov. 8, 1990, at datum 1.45 lower. Satellite telemetry at station. 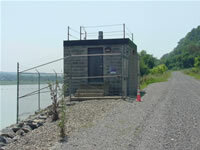 REMARKS.--Flow regulated by Lake Lynn 11 mi upstream, since May 1938 by Tygart Lake (station 03055500) 69 mi upstream and by Stonewall Jackson Lake 120.6 mi upstream, combined capacity, 432,000 acre-ft. Supplied by NWS: Action stage-15 ft; Flood stage-21 ft; Moderate flood stage-25 ft; Major flood stage-27 ft.